This documentary focuses on three people who aren't happy in the Hasidic community and are trying to break away. (Hasidim are a close knit of ultra orthodox Jews who live by very strict laws. They don't believe in anything secular). There's a woman named Etty with 7 children, who has an abusive husband who she is trying to divorce. There's Ari, who isn't sure about if God exists and is excited to learn about secular things. He talks about discovering Google and Wikipedia and feeling like he was in heaven. Lastly, there is Luzer, who was married with two children, who just wasn't happy, he learned about the outside world from watching movies in his car. He wanted to act and left his family to move to California. 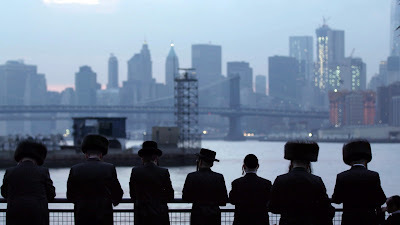 The documentary is well made and it's a sad glimpse of the lack of freedom that the Hasidim have. Etty's story in particular was very upsetting. Her whole family turned against her for wanting a divorce. People stalked her and harassed her. The husband wanted full custody of the children. These Hasidim seem to live by different laws that the rest of the world doesn't. How is this allowed in the US? The film states that only 2% of people leave the Hasidic community. One man in the film mentions that most people are content with their lives. But how many really are? How many are miserable and too scared to break away? Breaking away, means leaving your family. This documentary was a good glimpse into lives we don't hear about often. I would be interested in finding out where these three individuals are a few years from now. ONE OF US plays again at DOC NYC Thursday, for tickets and more information go here.